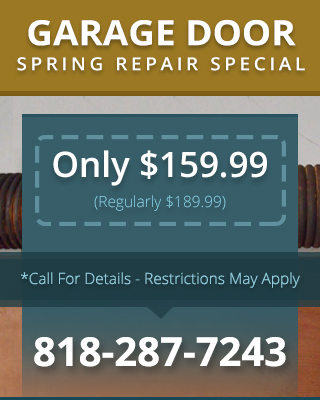 Garage door spring repair is dangerous if you don’t know what you’re doing, which is why we recommend calling us for this particular type of garage door repair & service in Camarillo Heights CA. 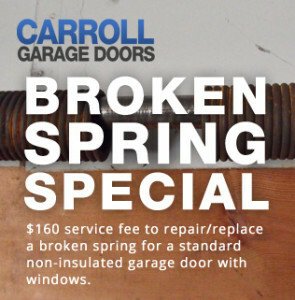 Calling us when your springs need replacing will prevent a spring from suddenly releasing its tension and cutting your finger or breaking off and damaging your property, and also ensure that the new springs are installed properly to deliver efficient door operation. If you have custom garage doors, you should protect your investment by getting expert maintenance and repairs. Carroll Garage Doors knows custom doors top to bottom, because we create them. We can provide you with garage door repair & service in Camarillo Heights CA for your custom doors regardless of whether or not we built them. It doesn’t matter what style of custom set up you may have, we can help. We frequently work on wall-mounted, swing-open, and roll-up doors. Specialty garage door opener systems are also within our range of expertise. Even if you’re not sure what part of your garage door needs repair, you can call us out to take a look. If you decide to make a repair, the service call is free.